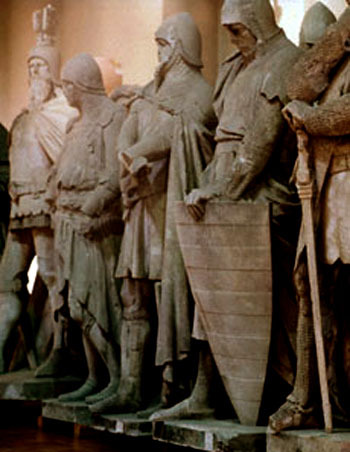 Another class in medieval society, in addition to the clergy, was the military class. It had the obligation to shed its blood for the defense of society. At that time, people did not understand the military class as a career, like any other, as we often do today. In the Middle Ages there was a strongly marked distinction between those who took up arms as a vocation to protect society and those mercenaries who sold their blood to the State for money. Then, a Prince who needed soldiers would contract those troops to come and fight for him. The word mercenary did not have a pejorative sense. Those were men who liked to fight; they were hired by those who did not like to fight and were willing to pay the former to fight for them. When pacific peoples realized they would have to enter a tiresome war, they would contract mercenaries to protect their cities or their frontiers against the enemies threatening them. In the Middle Ages, mercenary troops were very faithful to their masters. It was not until the Renaissance that it became more frequent for mercenaries to change sides; but in the Middle Ages, they would combat with fidelity. We find a later example of the medieval fidelity of one of those corps when the French Monarchy fell. Then, the mercenary Swiss troops fought to the end for King Louis XVI in 1792 when the revolutionaries stormed the Tuilleries Palace in Paris. They were the last ones to remain faithful to the King, fighting against the Revolution to the point that they all died for the King. 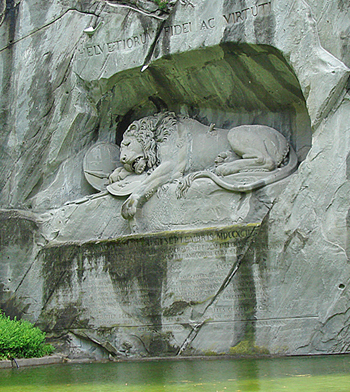 Today there is a Lion Monument in Lucerne, Switzerland, commemorating that heroic event. In a cave carved into a cliff of one of the Swiss mountains there is a mortally wounded lion with a foot handing over a shield bearing the fleur-de-lys. Behind it, is another shield bearing the coat of arms of Switzerland. The inscription above reads: “To the loyalty and bravery of the Swiss” [Helvetiorum fidei ac virtuti]; under the lion are the names of Swiss officers who gave their lives and the death toll of the Swiss soldiers, numbering 760. It is a homage of the Swiss people to those mercenary troops who fought with great fidelity for the French King. The last vestige of a mercenary troop today is the Swiss Guard of the Pope. Everyone knows that the members of the papal Swiss Guard are soldiers from Switzerland. They go to Rome to be guards at the Vatican, receive a certain salary, and serve very well. From these examples, we see that the occupation of the mercenary soldier was an honest and respectable one in the Middle Ages. Very different from this was the actual military class of the country. A medieval military was a man who renounced everything good that life can give in favor of the common good. I consider the Middle Ages to be the most combative time of History, the period that produced the largest number of great warriors, men of enormous courage, the epoch that most glorified courage. It is curious to see that this epoch was keenly aware of what is most pungent and dramatic in the military milieu for those who deliver themselves body and soul to it. Behind such an attitude lays a whole Catholic theory of courage. Once a German priest described to me how Hitler selected the men to serve in his top elite assault corps. He would place all kinds of obstacles in an enormous race track and have a number of youth go through it. There were all kinds of obstacles: fire, pools, towers, holes and many other things difficult to overcome. When a youth ran through all those obstacles without even thinking and conquered them, this was proof that he was good enough to belong to that assault corps. But if the youth would stop to think before going though the obstacles, even if afterwards he actually got through them, he was not considered brave enough for that corps. The conception of courage behind those tests is erroneous, entirely based on impulses. The German priest who told me this, by the way, clearly observed this defect. Courage is not to jump into danger without thinking about it. Courage consists in assessing the full danger, and then deciding to face it with a deliberate act of the will. The perfect example of this is Our Lord Jesus Christ in the Garden of Olives. Christ is the pattern, the prototype of heroism. In the Garden of Olives He did not assume the attitude of an impulsive man; this would not be keeping with His infinite sanctity. He measured all sorrows and pains He would suffer; He had such a fear of those sufferings that He perspired blood. But, despite that repulsion, because it was His duty to face those sufferings in order to accomplish the mission the Eternal Father had given Him, He faced everything, He carried His Cross to the top of Calvary, allowed Himself to be crucified and He died. There was a deliberate act of His will commanding His actions. 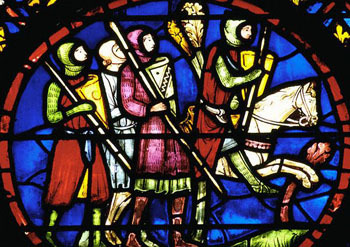 The Catholic medieval knight was a man who had this conception of courage. He was fully aware of the danger he faced. Medieval literature describes to us many manifestations of sadness of the knight going to the war. He would weep as he made his farewells to his family. Often his family would follow him for a certain length of the road. Then, in the last farewell, they would promise to pray for each other at a certain time of each day. In these descriptions one realizes the profound sense they had of the dangers they were facing – the risk of death, of being wounded, of falling captive into the hands of the enemy, etc. - as well as the pain of separation. The medieval knight suffered from this. Today, according to a pagan model in fashion, a man should be insensible to any sentiment: if he were to lose his father, mother or son, he should remain insensible, without emotion. In the Middle Ages such an attitude would be considered stupid. The medieval knight had sentiments and suffered when they were hurt. Man naturally has emotions and it is normal for him to express them. Thus, at times those knights were courageous enough to split a Turk in two or to make their way into a city alone to reach the mosque just to have the pleasure to be the first to destroy the cult to Mohammed. At other times, one of those same men could be moved by the situation of a widow and weep abundantly. How can these apparently opposed sentiments be explained? The internal equilibrium of a man facing pain and danger was different from what it is today: it was very Catholic. The medieval knight was familiar with the idea of duty. Although he had a clear notion of the risks of war, he had supernatural motivations - deduced from the Catholic Faith and Revelation - that led him to run those risks. For these reasons he would expose himself to the combat and the fight.